You’ll be running on some of the nicest trails the the Long Island Greenbelt has to offer. 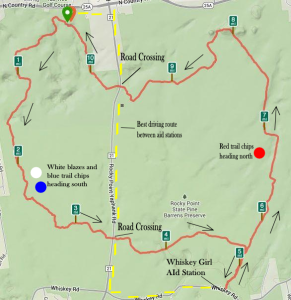 The course is set up as a loop, with a little less than .4 mile of an out and back to get you to the Whiskey Girl Aid Station. 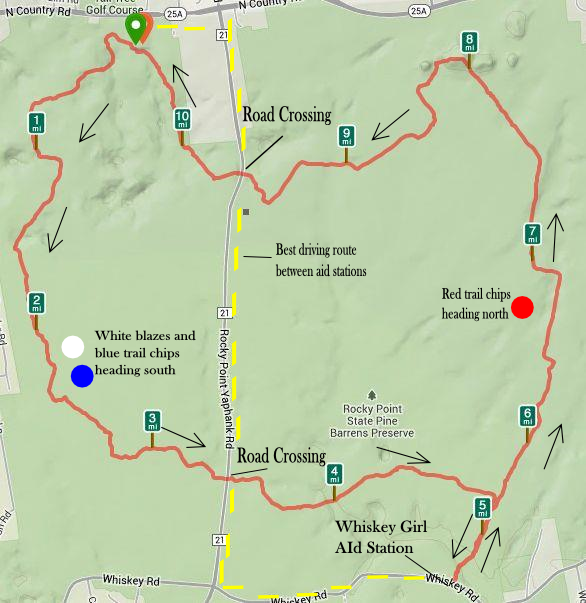 You’ll be following the white/blue trail all the way south to aid and then come back on the red. Pretty easy. There will be pink survey tape markings 100% of the time. So you can just stick with those. First – each loop is 10.4 miles ( roughly) which means something REALLY cool. YOU have a chance at not only running 1, not 2, not 3 but 4 WHOLE marathons in a ROW, yeah that’s right one right after the other. That’s something pretty awesome. Second – The course is pretty flat. Even by Long Island standards there aren’t a LOT of hills. Though there are a few and you’ll be running over them 10 times, so it’s still not easy. Please don’t let the course being flat fool you. This is NOT an easy 100 miler. There are a lot of twists and turns, it’s fun and exciting, but don’t think you’re just going to wing it. Last year we had over a 60% DNF rate in the 100m option alone! Third – The terrain! Again, it’s Long Island so there isn’t a lot of different surfaces you can run on around here. Though, it’s beautiful. You’ll be running through some Pine Barrens, some access paths, and some beautiful areas really. 99% trail. You have to cross 1 road twice. So in short, a lot of loose dirt, some minor roots, and a bunch of pine needles.